How will this course help me and my business? This interactive online course will help you or your team rapidly learn the fundamentals of successful digital marketing. It will guide you through how to create a structured plan to grow your business using digital marketing. 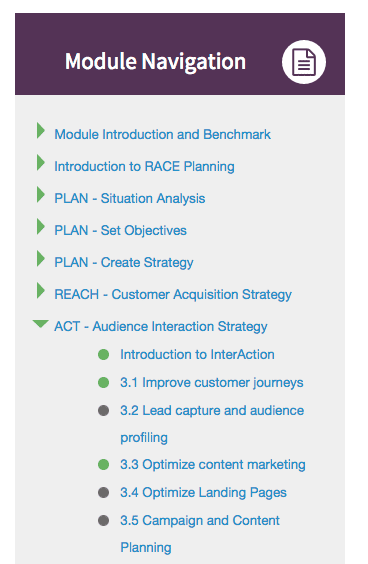 It's structured using our acclaimed RACE digital marketing planning framework which covers the full customer lifecycle. Unlike many e-learning courses in digital marketing which can be academic, superficial or overly-theoretical, our course is designed to be super-practical. As you complete each topic, you will create a digital strategy or plan for your business or your clients using our digital strategy workbook. This isn't a top-level introductory course – it drills down into the 25 key activities you need to get right to create a complete digital marketing strategy. If you're looking to upskill your team, it's a cost-effective way to get your team to a common level of understanding of the opportunities and best practice techniques across digital marketing – learn more about Business premium membership for teams. People in these roles often have good levels of experience in traditional marketing but may have varied levels of knowledge about digital marketing. The Smart Insights Digital marketing e-learning course has been independently assessed and accredited by the CPD Standards Office, so you can be confident that the quality of the learning and assessment experience has been audited and recognized for its quality. If you are following a CPD programme you can assign 40 hours of the course to CPD when you complete our e-learning course. How is our e-learning structured? This course is structured around the Smart Insights RACE planning framework, so it’s designed to cover all the different digital marketing activities every business needs to succeed in their digital marketing. The initial phase, ‘Plan’ involving creating the overall digital strategy, objective setting and roadmap. For each part of RACE, we have defined 5 key digital marketing activities to help brands improve results throughout the customer lifecycle. The course is structured around these. What will I get from completing this e-learning course? 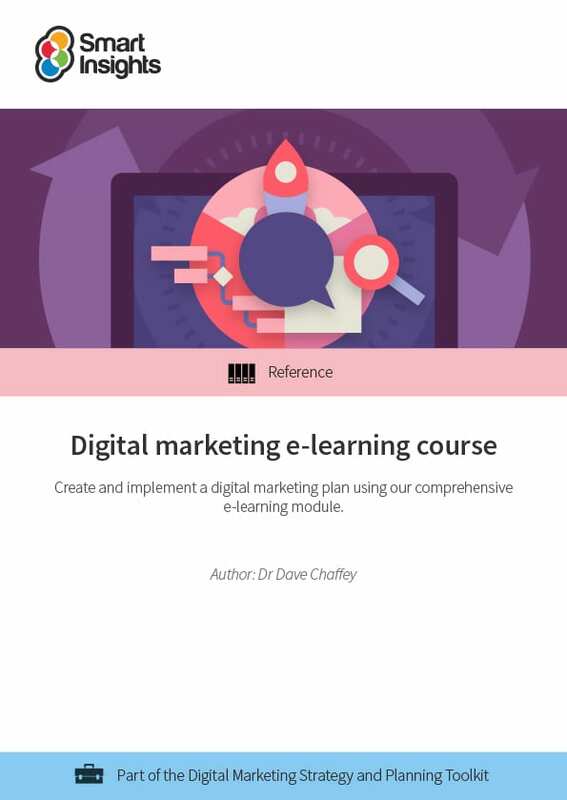 The RACE Digital marketing e-learning course and the companion digital plan workbook are designed to help you develop an actionable digital marketing plan that will help your business grow. A digital marketing strategy with a detailed plan will help you get great results from digital and prevent you from wasting time with ineffective tactics. As you work through each unit in this module, you will cover 25 numbered topics covering best practice for all activities involved with creating a digital plan. The topics will be marked off in green when you review them after completing an optional quiz. To prove your new and existing knowledge and experience of digital marketing, there is an optional drag and drop quiz ‘Final Assessment for Qualification‘ drawing on optional questions at the end of each topic. Format: Interactive e-learning course with strategy recommendations, best practice tips, examples and quizzes. You can start at the beginning or go straight to the digital marketing technique you need to improve. Learning time: 30-35 hours including updating the digital marketing plan workbook to create a plan. Certification: If you complete the optional interactive questions in each topic and score more than 70% in the final optional test you can download a certificate to prove your knowledge of digital marketing. The course is accredited for the quality of the learning experience and assessment by the independent CPD Standards Office as explained in the section on accredited. Latest update: All modules updated for 2019. New video summaries introducing each part of RACE recorded with Dave. Dave is co-founder and content director of Smart Insights. He is editor of the 100+ templates, ebooks and courses in the digital marketing resource library created by our team of 25+ digital marketing experts. Our resources used by our members in more than 100 countries to Plan, Manage and Optimize their digital marketing. 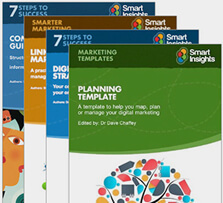 Business members get full access to this and 16 other guides in the Digital marketing strategy and planning Toolkit.